Hello Sudi! Enjoyed your comments on the Selvam Siddhar episode, and got the link to this blog from the Fox5 blog. Please do a nice spiritoon on Dr. Commander Selvam Siddhar Swamiji. It will be very topical !! Hello Valmiki, Thanks for your comment. Yeah, that episode is an interesting one! And how can I sit idle when things go on like this? :) Expect something interesting from me in the days following. 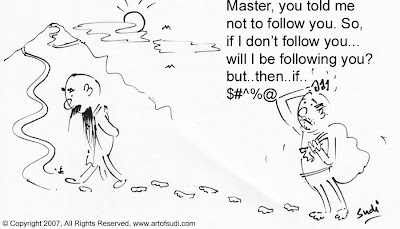 Hello Sudi, you gave me a big smile with 'master don't follow me'. Thanks for visiting my blog. Happy to hear it gave you a big smile -much needed in our times -. Thank you Sw. Teerth for visiting my page and reflecting on my article. I have heard of your page for a while now and from time to time have viewed the cartoons. They are absolutely terrific! This one especially strikes a chord and is very to the point, for any person trying to find themselves, expecially Osho Sannyasins. You caught the juice of the whole saga thats going on today, awesome! !